The Board for Media Ministries of the Brethren in Christ Church — an entity that included the work of Evangel Press and Publishing House in Nappanee, Indiana — has closed, ending 126 years of service to the denomination. A statement released by the denomination in June outlined the transition of duties from the board to the Brethren in Christ Church U.S.’s Communications Office in Grantham, Pa. In response to grassroots requests for a denominational magazine, the General Conference of 1887 formed a “Publication Committee.” The committee named one of its members, Henry Davidson, as the first editor, with the first issue of the Evangelical Visitor dated August 1, 1887. In 1920, after the editor’s office had moved from Kansas to Pennsylvania and then to Indiana, General Conference authorized the Publication Board to purchase its own printing equipment. For several years, the printing operation was located in rented space in Nappanee, Indiana, but in January 1925, it moved into its own new building at 301 N. Elm Street, Nappanee. The new building included space for a bookstore and a mail order business for Christian literature, which was called the “E.V. Publishing House Bookstore.” The Publication Board also provided tracts to a variety of denominations and individuals through a “free literature department,” and instituted a traveling library that sent 25 books each quarter on a rotating basis to participating Brethren in Christ congregations. In 1921, as part of the denomination’s efforts in strengthening its sense of self-identity, the Publication Board began publishing Brethren in Christ Sunday School literature, especially take-home papers: Sunbeams, for younger children (1921-1958); The Youth’s Visitor, for older children (1921-1958); and later The Sunday School Herald, for young people and adults (1937-1958). (When all three were discontinued as uniquely Brethren in Christ publications in 1958, the titles were continued for four more years as imprints of Gospel Light Publication materials.) In 1977, the Publication Board and the Board for Christian Education represented the Brethren in Christ in the Foundation Series Curriculum (an Anabaptist curriculum produced from 1977-1993) and its successor curriculum (Jubilee, published from 1994-2006). As early as 1919, the General Conference authorized the Publication Board to sell Sunday School and other Christian literature, Bibles and other related items as part of its ministry. With its new building in Nappanee, the Publication Board in the mid-1920’s was able to expand its wholesale division, selling various Christian literature and related items by mail order as well as in later years fielding sales representatives who made personal contacts with bookstores in nearby states. A local bookstore serving the Nappanee area was located at the Elm Street location. 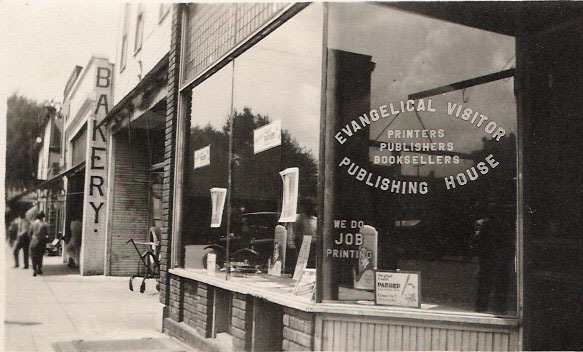 In 1942, General Conference authorized the Publication Board to establish a second bookstore, locating it in Elizabethtown, Pennsylvania. In 1945, a third bookstore was started, in Chambersburg, Pennsylvania. Nine years later, in 1954, a bookstore was started in Upland, California, and a decade later, a store was opened in Brantford, Ontario, Canada. With a 1957 name change from “Christian Light Press” to “Christian Light Bookstores,” the number of stores topped out at 16 locations in 1994. By 2002 the number had been reduced to 12, and the last stores were sold in 2008. In the denominational reorganization of 1984, the Publication Board was renamed the Board for Media Ministries. For most of its 126 years of service to the Brethren in Christ Church, the work of the board has encompassed three major areas: Editorial (the Evangelical Visitor and editorial work done on other publishing projects); Publishing (books, hymnals, and other materials printed for both the Brethren in Christ and related organizations); and Merchandising (Christian Light Bookstores and the wholesale department). To read the entire statement in full, click here.